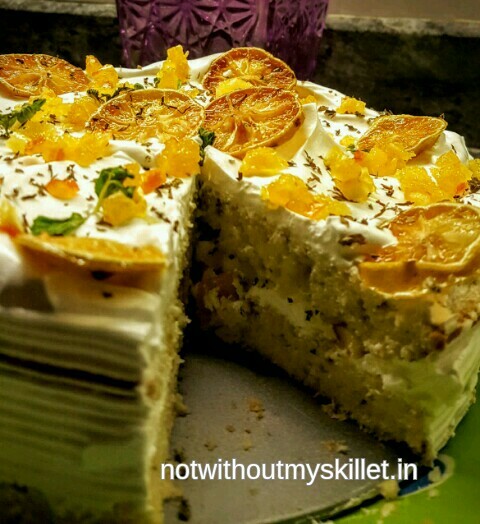 Cooking this cake does need a bit of time and planning, but that goes for most cakes. It also requires for you to be in the right mood to cook, it a is a longish process. And you will want to share this cake with friends, so make sure you have a party to take it too. Cakes do need planning, I suggest you identify, buy and measure out all your ingredients over two days prior to baking this cake. 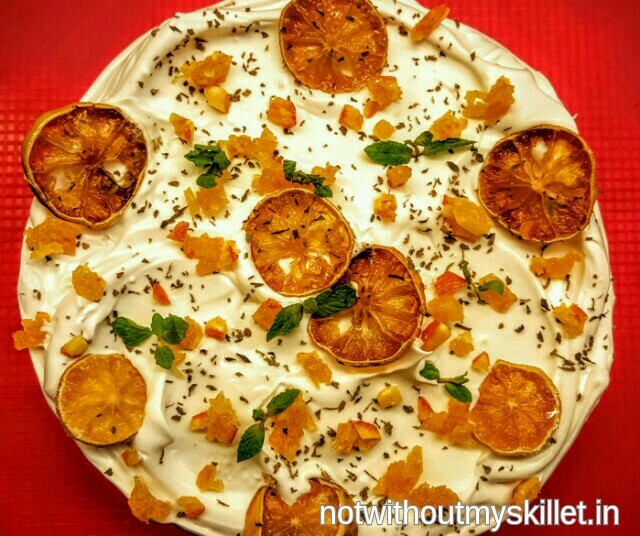 Some of the ingredients needs to be bought specially for the cake, but will stay well in your pantry for a good year or two, like for example the dehydrated mint, rum essence and even dehydrated lemon or orange slices. 1. Pre heat your oven to 180 degree centigrade. 2. Crack the eggs and separate the white and yellow. 3. Beat the white till it stands in stiff peaks. 4. In another bowl cream the castor sugar and butter together, add the yellow of the egg, rum essence and lemon barley and mix well. 5. Add the beaten egg white to the yellow and mix the two together with a wooden spoon using the figure ‘4’ action. Ensuring you do not lose the air. 6. Now mix in the sieved flour and half the dehydrated mint using the same action. Do not over mix. 7. 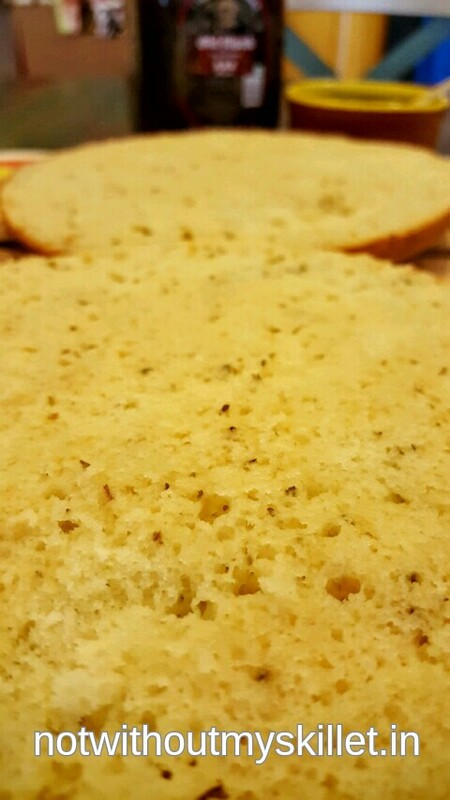 Line a baking tin with butter and sprinkle some flour over it to coat the entire surface area. 8. Pour the cake mix in it. And bake for 30 to 35 minutes in a pre heated oven. 9. Remove from the oven and let cool. 10. Meanwhile whip up your cream to stiff peaks. And keep in a cool place. 13. In a small bowl mix together the glycerine, lemon juice if using Bacardi add at this stage. With a spoon pour the liquid all over the open faces of the cake. This helps keep your cake moist. It’s important to use a nice and think layer of cream in this cake. It breaks the acidity. 14. Now start building your cake. 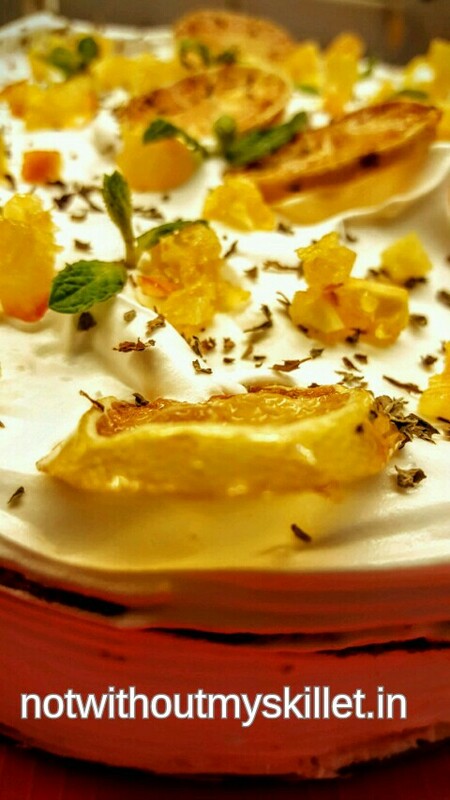 Add a thick layer of cream, sprinkle some chopped lemon or orange slices on the cream and add the dehydrated mint. 15. Place the second layer of cake and ice the top and sides. 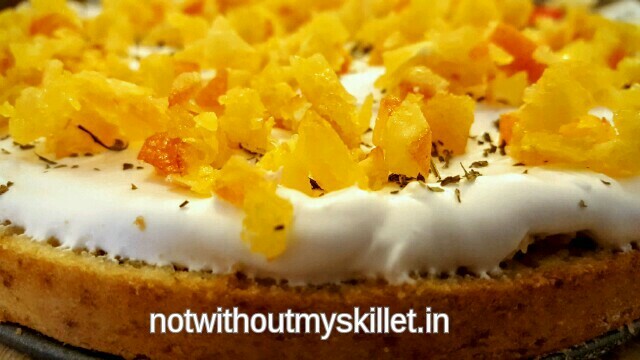 The lemon slices adds a nice dimensions to the cake and makes it a true Mojito cake! 16. Now slather the top of the cake with dollops of cream and use a spoon to create indentions. Drop your sugared lemon slices in these indentions. Add a layer of the chopped fruit and sprinkle some more dehydrated mint on top. Finally top it with few springs of mint! 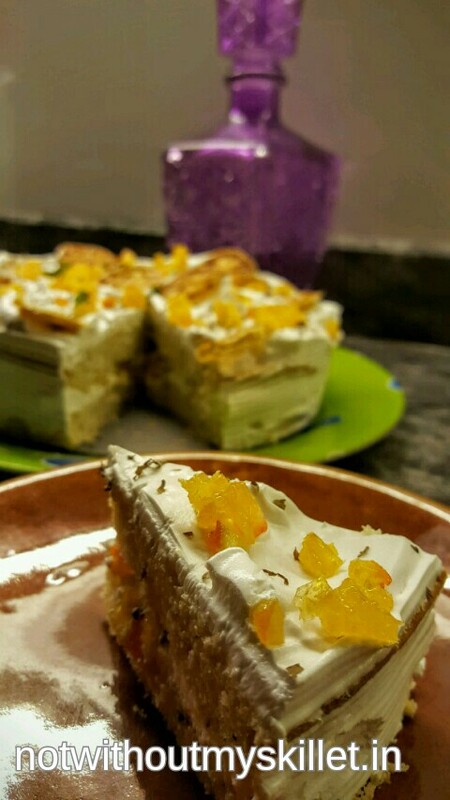 Enjoy this cake with a glass of Grand Marnier! And it’s super fun to make too..will bring out the artist in you!